Connecticut based real estate firm. This web site is featuring 5 IDX/RETS datafeeds from 5 different MLS Boards: Statewide Connecticut MLS, Greater Fairfield County MLS, Greenwich MLS, Long Island MLS (LIBOR) and Westester-Putnam MLS. Back end operates on PRO5 Enterprise System - with access to WebMail interface for each agent in the company. We provide web products for real estate industry as: IDX / RETS / data-integration as properties searches from your MLS, web design, for real estate Brokers or Agents. 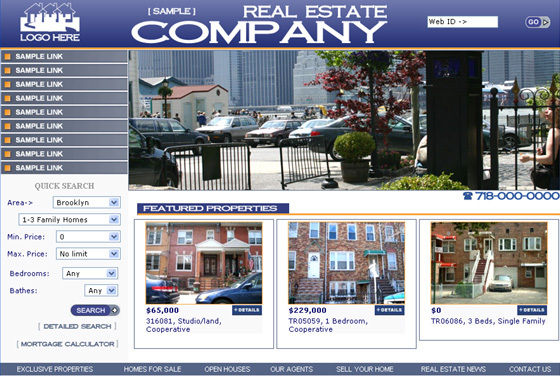 Queens, NY Real Estate - site featuring RETS Raw Data Integration from Long Island MLS (LIBOR). Website owned & operated by RE Agent, Sergei Kachenkov. Now on twitter.com/Pro5Homes - features automatic postings (tweets) from your web site. Now on facebook.com/Pro5Homes - featured automatic listing postings from your web site. Top Nest Inc is Brooklyn NY based Real Estate Brokerage, member of Brooklyn NY MLS. Company had active web site developed by other web developer. Top Nest was not happy with main function of real estate web site - Properties Searches; practically property-search was dysfunctional/ and not applicable for Brooklyn area properties searches. We took over this project, set up Properties Searches, as well as other functions with implementation of raw data via IDX/RETS from Brooklyn NY MLS. Starealty.estate is an innovator in case of their domain, not a .com!! They had active web site developed by other web developer. Company was not happy with visual appearance & functionality of their web site. Very confusing navigation, web visitors could not find anything what you'd expect on real estate web site; property searches were dysfunctional. We took over this project, set up new web site with implementation of raw data via IDX/RETS from Brooklyn NY MLS for Properties Searches. We design and develop complete real estate web systems with IDX / MLS / RETS integration as interactive searches, picture gallery, virtual tours, interactive maps and advanced back end for Web Site Administration. Realty Depot - Queens based real estate brokerage. We set up new web site, feeded from LIBOR (Long Island Board of Realtors), area-coverage includes Queens. Property Searches done via IDX/RETS raw data. Coldwell Banker Mid-Plaza Real Estate - medium size RE Brokerage Firm in Brooklyn, NY. We took over existing static company's web site & converted it to dynamic data-driven website with data-population via IDX/RETS from Brooklyn NY MLS board. Elbe Estate web site featuring - IDX/RETS data-implementation from Brooklyn NY MLS board. Brooklyn based Real Estate Brokerage with RETS Raw Data Implementation from Brooklyn, NY MLS. Brooklyn 4U Realty Group - web site featuring - IDX/RETS data-implementation from Brooklyn NY MLS board. This real estate web site features Brooklyn's IDX / MLS data implementation with full integration of searches for MLS properties on public web site. Site is CMS type, fully database driven and managed by client from easy to use custom built Admin Panel. Brooklyn base Real Estate Firm. Web site with REST/IDX Raw Data feed & integrated searches for MLS properties. Client uses advanced back end system to maintain information pages and manage incoming real estate leads. Each agents in the company has it's own logins to manage buyers in the database, download forms or other company's documents, generate flyers, search company's listings inventory & more. How Often the IDX / MLS data will be updated on Real Estate Company's Web Site? IDX / MLS data will be updated automatically on daily bases. Client, the real estate broker or real estate agent is responsible to maintain IDX / RETS / MLS data account in a good stand. Will IDX / RETS data implementation from your MLS on your web site improve your web site ranking in search engine results? Yes, it will. IDX / RETS searches will add between few hundred to several thousands of web pages to your web site and each Listing Details page contains relevant key words and key phrases. Can Remote Web Developer Work with MLS / IDX System in Your Area? Or in other words, does the web developer for MLS / IDX data implementation has to be local and be familiar with specifics of local Real Estate market? Not really. In the process of working with IDX / RETS Data accounts web developer is dealing with database compatible data and all needed information about specific areas and locations is provided in the IDX/RETS Data from MLS company. Data feed will be provided from designated MLS / IDX system (you would need to open a data export account with them) in your area. We will handle all aspects of this process and smoothly integrate property searches on your web site. This product aimed for Real Estate Companies with multiple offices. Can this database system be effectively used by Real Estate Company with single office location? Answer is yes! This intranet-based interactive tool will help your handle your daily Real Estate needs more effectively. In short, PRO5 Database System is a very advanced tool for real estate companies and usually comes with your public web site integration. Functionality of PRO5 Database System is very complex and requires at least 2 hours of in person meeting or telephone conference (full attention, no interrupted phone calls please). Live demo is also available to qualified customers per individual request. We are very proficient in data exports and datafeeds for marketing needs for our real estate clients. We set and maintain datafeeds to: trulia.com, nytimes.com, optonline.net, google base, streeteasy.com, leadingre.com and other real estate portals and search engines. Web Site Design & Development for Real Estate Broker or Agent. MLS or IDX searches for real estate related web sites. Back End products: Admin Panel for small agency, full or partial CMS, Rental Office, PRO5 Database - Real Estate Company intranet & database system for multi-office, with multi web sites integration. SEO (Search Engine Optimization) of new or existing real estate web site. Managed Web Hosting services or managed Linux servers. Data back ups and WebMail @yourdomain based email services. What is IDX Stands For?